UnSheeping is an online travel agency, with apps for iOS and Android, that claims to let you get a hotel for free. They reward their customers with various account credits and discounts that can be used to pay a part of a hotel stay or even get one for free. UnSheeping set themselves apart from other OTAs with their smart loyalty program and a quirky name, that reflects that their customer is a rational traveler, who can decide when and how to earn and spend their rewards. (n.) the opposite of sheep - that is, a person who is not a sheep. The opposite of conformist. A person who is mindful, rational, and able to analyze and make independent decisions. IS AN ATTRACTIVE REWARDS SCHEME ENOUGH? UnSheeping have a great rewards scheme but they were struggling to provide an equally smart hotel selection process. Different travelers are looking for a different kind of stay: culture lovers want to be close to sightseeing areas and foodies want to have a choice of best restaurants around them. UnSheeping needed a way to show how well suited a hotel’s location was to a traveler’s particular interest. TopPlace™ location insights platform by AVUXI allows UnSheeping to take the hotel selection process to the next level. Thanks to its Heatmaps, UnSheeping can now offer a more personalised search-hotels-on-a-map UX. Now their customers can easily see which hotels are located in their area of interest. Another step in improving the hotel selection process was implementing TopPlace™ Location Score Elements. 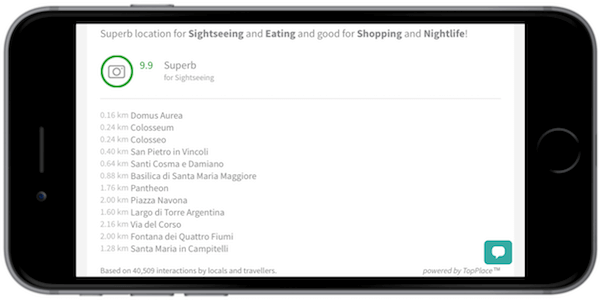 Thanks to them, UnSheeping can now show their customers how well a hotel scores for particular traveler activity, and also display the nearest sights. TopPlace™ location insights by AVUXI has helped UnSheeping to improve customer booking experience. An attractive loyalty scheme coupled with superior booking experience delights their customers. With the help of AVUXI’s products, their goal of being the hotel booking app of choice for a smart and rational traveler is now even closer.